In a effort to cut back on our meat consumption, I’ve been incorporating more meatless meals into our diet. It can be a challenge creating meals that are satisfying enough that meat isn’t missed. I’ve found that that’s the key is to make sure the meals are outstanding and it bold on flavor. This recipe has been sitting in the archives for quite a while; I somehow forgot to post it. I’ve made this exact recipe quite a few times for my family and it’s always a home run. I combined a medley of my favorite vegetables and cooked in a curry broth. I’ve made this with and without the coconut milk but prefer it with the coconut milk. It almost makes me not miss meat…almost! 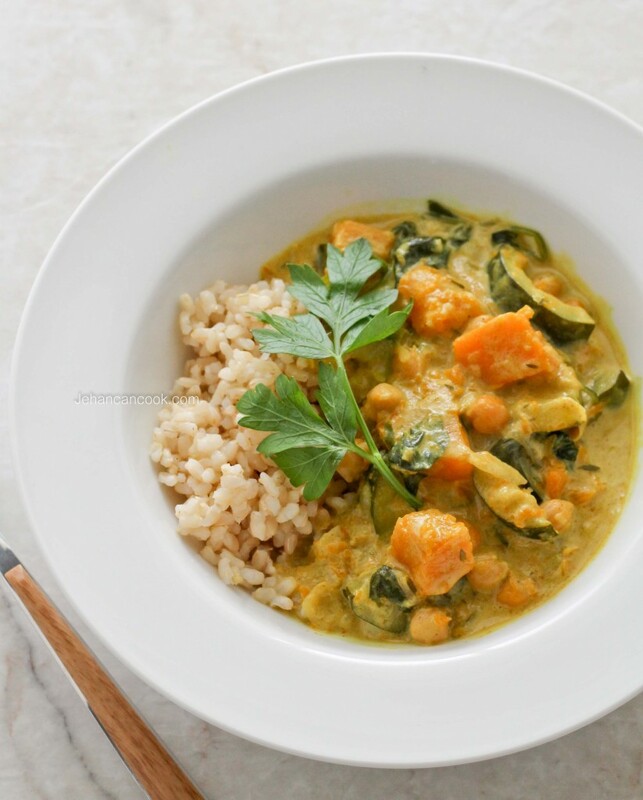 I used pumpkin, zucchini, spinach and chick peas, but you can use any combination of vegetables that you love. Make a curry paste by mixing curry powder, cumin and water in a small bowl. Place a large heavy bottom pot over medium heat and heat oil until hot. Add curry paste and cook for 5 minutes, stirring occasionally. Next add garlic and ginger and cook until fragrant, about a minute. 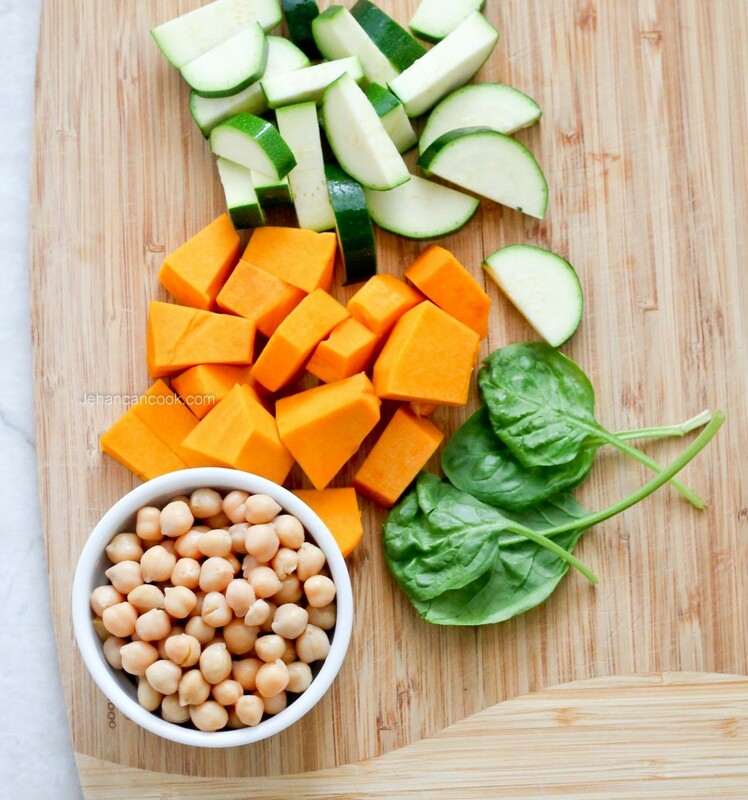 Add pepper, thyme, chick peas and vegetable broth and bring to a boil; cook for 10 minutes then add zucchini and pumpkin. 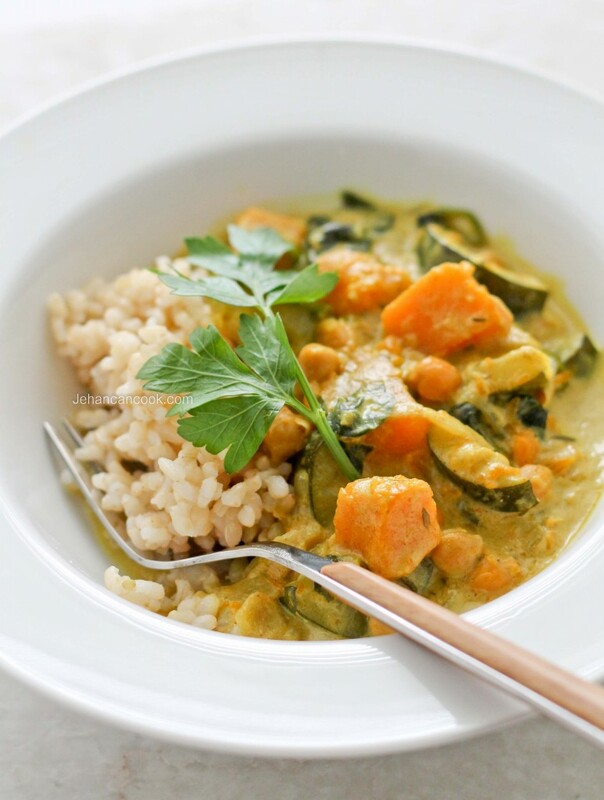 Cook until pumpkin and zucchini are tender, about 10 minutes then add coconut milk and spinach. Cook for an additional 10 minutes then add salt. Remove from heat and then serve over rice. This sounds really good. My husband is a huge carnivore as well (Jamaican lol) and I’ve been trying to find something to cut back on his meat consumption. Maybe this will work HA! I tried this recipe it was so delicious thanks you!